The last 4-5 years have seen a lot of chaos created by malware and viruses. Initially the malware that only targeted home users gradually increased their target area by attacking big companies like Yahoo, Uber, Equifax and many more. These companies have had to pay a hefty amount to get back their data from the attackers. In the wake of some serious damages caused by malware, many new anti-malware and anti-virus companies also evolved with a promise to remove malware and viruses on your Windows PC. But very few live up to this promise. Therefore, just having an anti-virus and anti-malware utility on your PC is not enough, one should know how to effectively remove these infections from the PC. How does Malware or Virus Get on a System? Well, there is no known or fixed source of malware or virus. This means that there are several reasons for a malware to enter your system and that too via any medium. Downloading a program from an unknown or untrustworthy website may lead to downloading a malware. Downloading a movie or a song over Internet via Torrents or unknown sites often opens a door for malware on your PC. Getting data from an infected pen drive or external hard drive is another medium through which malware can enter your system. Surfing on a compromised website is again a root cause for a malware to enter into a system. So, if your PC is responding slowly or your browser is filled with unknown extensions that you have never installed or there is a change in the homepage of your browser or error in opening files and folders, your Windows PC is infected with a virus or malware. Now that once it is confirmed that your PC is infected with a malware the next move is how to remove that malware or virus from the system. When you boot your PC in safe mode only the basic and elementary files and their settings load. You can load your Windows in safe mode with networking or without networking, i.e. with Internet or without Internet. But initially we go with normal safe mode as many a time it is seen that if a PC is connected to Internet then the malware starts updating itself to spread more strongly into the system. Also, a malware can transfer your confidential files and data from your system to its remote servers using the active Internet connection. Now the steps for booting into the safe mode will depend on the version of Windows installed on your system. If Windows 10 operating system is installed on your system then click here to get the detailed steps to get into the safe mode. To get the steps for getting into safe mode in Windows 8 please click here. For the users who are still on Windows 7 can get the steps by clicking here. Once you get in the safe mode you will find a drastic change in the performance of the system. This is because only basic Windows files load in safe mode disabling all the process that start with the system and keep on running in the background. Temporary files can be a place where a malware can hide. Therefore, if you clean the temporary files in safe mode then there is a possibility that malware will also get removed. The other benefit of removing temporary files from the system is that we free the space on the hard disk that was earlier unnecessarily occupied by temporary files. To remove temporary files type %temp% in Windows search and press Enter key. Now press Ctrl + A to select all temporary files and folders. Once selected, press Shift + Delete to permanently delete these files. You can consider using Disk Cleanup, an inbuilt tool of Windows to clean the temporary and other unnecessary files from the system. Type Disk Cleanup in Windows search bar and press Enter key. 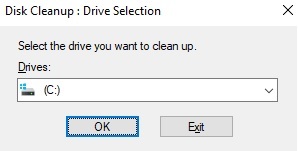 You can now select drive that you wish to clean including the system drive and click Ok. If you find your browser flooded with all types of toolbars that you have never installed or you find that the homepage of your browser keeps on changing or that you are unable to set a desired homepage for the browser, then it means that your browser is hijacked by a browser hijacker. Also, it may be possible that a malware has installed a buggy extension or add-on in your browser when you surfed an infected site. Therefore, to resolve all these problems browser reset is one of the best available option. Resetting a browser changes all the browser settings to the default. It will remove all the infected extensions that may have installed in the browser. Launch Chrome and click on Menu button located at the top-right corner and click on Settings option. In the Setting page scroll to the bottom and click on Advance. Now again scroll to the bottom and click on Reset option. In the prompt that appears click on Reset button. 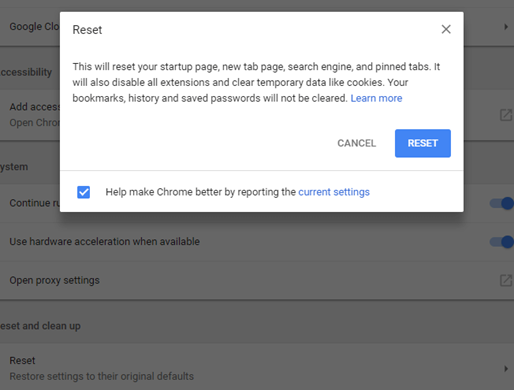 This will reset your Chrome browser settings to the default by disabling all the browser’s extensions and deleting cookies. Now in the address bar type about: support. This will open a page containing all the information helpful for troubleshooting. In the top-right side of the page click on Refresh Firefox button. In the prompt that appears click on Refresh Firefox to confirm. This will reset the browser to its default settings, removing all the add-ons. Launch Edge browser and click on the three dots at the top right corner of the screen. Now click on Settings from the drop-down menu. 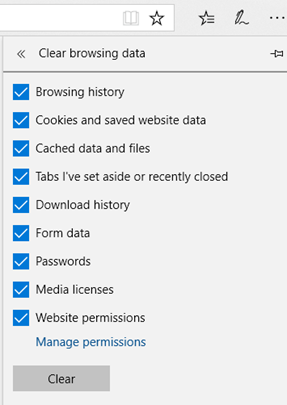 Click on “Choose what to clear” under Clear browsing data option. Check mark all the data types and click Clear button. This will clear all the browser data and restore it to default. Although the browser infection is mostly resolved by resetting the browser to its original state. However, in case the problem remains unsolved then you have to uninstall and reinstall a fresh copy of the browser from its official website. Since we are in safe mode the malware becomes less effective therefore there is better possibility of malware detection and cleaning in this mode. Now perform a complete scan of the system using your current antivirus or antimalware tool. The time taken by the scan to complete will totally depend on the size of your hard drive along with your system configuration. Therefore, please be patient and let the scan finish. Once the scan is finished, clean all the infections detected by your antivirus/antimalware program. This will probably clean the malware or virus that was residing on your system. However, if this fails then you have to update your virus definitions using safe mode with networking, as malware prevent the antivirus/antimalware definitions to update in normal mode. Restart your system in safe mode with networking and try to update the definitions to the latest. Now again perform a complete scan of your system and clean all the detected threats and infections. This will surely remove the malware/ virus from the system. If your current antivirus or antimalware program fails to clean the malware then go for another program based on its user reviews and ratings. Though this may cost you an additional amount it can still help you in freeing your system from virus. Though following all the above steps will make your PC free from virus and malware but in case luck is not your side and infections remain on your PC then you are left with only option, i.e. resetting your PC to factory settings. However before opting for this ensure to backup all your important data as no one wants to lose data accumulated over the years. You can manually back up all your important data using external hard drive but we recommend you use an online backup storage program that automates all the backing process. Tip: We recommend you use an updated antivirus or antimalware program while uploading and downloading your data from cloud. No one wants to get their PC infected by a malware or a virus, but the viruses that are developed nowadays are so lethal that they even trespass the security shield of your antivirus/antimalware program. Therefore, it is very necessary to learn not only how to prevent your PC from malware and virus but also how to remove them. If you have any suggestions or you wish to give a feedback then please leave your comment in the comment box below. ← How Safe Is Your Android Phone For A Digital Transaction?